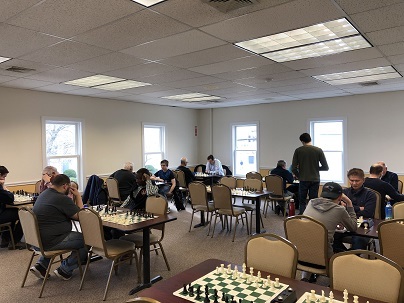 Today's match between the Chess Club of Fairfield County and their challengers, the Westchester Chess Club was an exciting duel between two local clubs. Each team fielded eleven players with each seeded player playing their counterpart in two games (one white and one black). 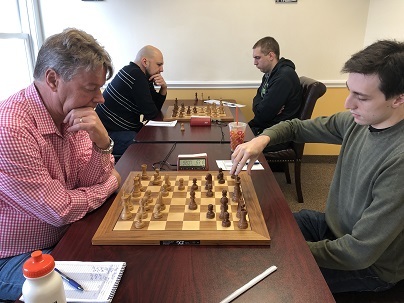 CCFC regular NM Oliver Chernin, the newly crowned CT Senior Champion NM Mikhail Koganov and CCFC instructor NM Ryan Young, along with a bevy of strong class A players led the CCFC team to victory with a final score of 19-3. 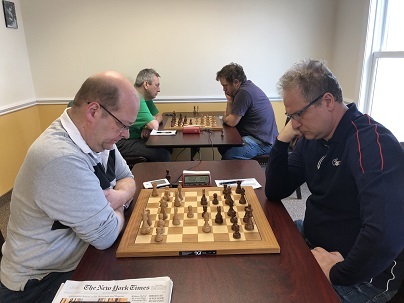 However, the final result was deceptive as, despite being the underdogs, WCC put in a valiant effort and made life very difficult for many of their higher rated opponents. A special thank you to WCC's top board Daniel Cooper who generously donated a pizza lunch for all of the competitors. Thank you to all of the participants in today's match!